Is your computer support guy giving you the runaround? I think it's about time someone finally got it right. That's why we decided to start IT Free Fall and committed ourselves to helping business owners. If you just want your IT problems handled quickly and correctly the first time, this book is for you! IT Free Fall - Saved ME! 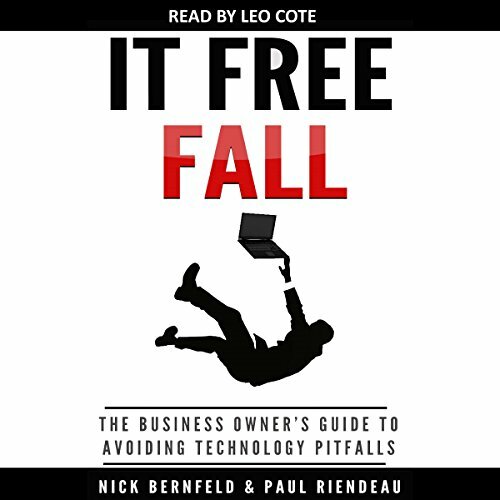 Would you consider the audio edition of IT Free Fall to be better than the print version? I like to Listen to Audiobooks on my way to work or to Clients. So The audiobook is better for me vs the print Version. Leo's Voice is nice and clear and he does not rush so i can understand all the words he is saying. I have been Hacked before and had passwords stolen so I was interested in what to look for when securing my Network. This Book did a Great Job of letting me know what i should look for in a Professional IT Company, that would make sure my files are safe and secure! I like to Hear the Different Stories about what other Clients have been through so i can avoid the same troubles that other people have had with Technology and avoid those pitfalls. As this is non-Fiction and not really comedy or Romance i did not really expect to Cry or Laugh but it was suprised at certain points of the book. Maybe a little scared how little i knew about IT Security. This is a Great Book if you are a Small Business Owner Looking for Help in Finding a IT Support Company and Don't know what to look for. Might not be the best book for a Home User or someone who does not work in a Small Business.